Henric Kalmeter, the Swedish “industrial spy” who we've met before in On This Day, was in Penzance on 25th and 26th November 1724. He'd travelled west from Truro to Falmouth and on to Helston and Marazion. On the journey from Helston he'd visited Wheal Vor which he reported to be largely idle since the removal of the fire-engine about three years before. This engine would have been the celebrated Newcomen pump generally reckoned to be the first steam engine to work in Cornwall. The precise dating of this engine has always been a problem but Kalmeter is an almost contemporary witness and he is fairly precise, a fire-engine was erected about seven years ago to draw up the water. It worked for about four years, but as that type of machine, particularly at that depth, is a mass of difficulties and subject to repairs, it is too costly. The engine was therefore removed……..That would suggest it was erected in 1716-17 and ran until about 1721. If Kalmeter had known back in 1724 just how much interest there was to be in this engine in later years he might have taken the trouble to gather more information. However he didn't and in fact Henric himself was hidden from view until translated and published by Justin Brooke in 2001. 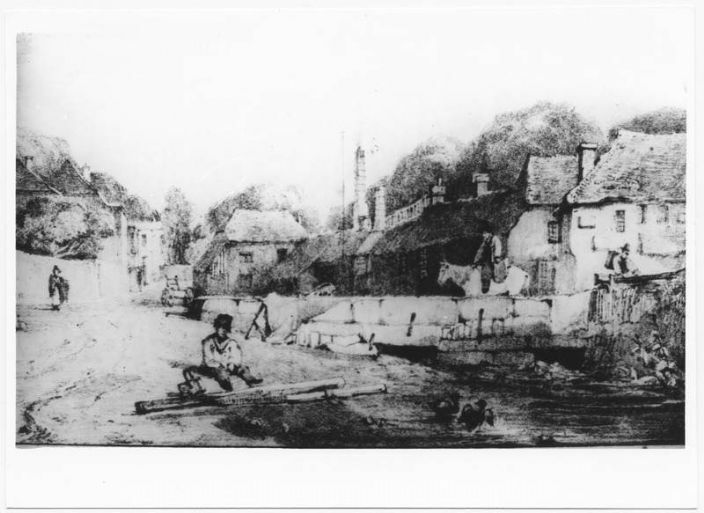 Having missed out on seeing the Wheal Vor fire-engine by three years Kalmeter then took himself to Godolphin Bal and Godolphin melting house where the Bal was still a significant tin producer but the melting house had not worked since the death of proprietor Francis Penneck two years before. (The burial of Francis Penneck is recorded in the Helston burial register as 20th March 1722) A melting house tended to be the name applied to an old style blowing house melting stream tin using charcoal and a water powered bellows. By Kalmeter's time these melting houses had more or less disappeared from the scene as they had difficulty in smelting the lode tin which came from underground workings. When Kalmeter arrived in Penzance it had been a coinage town for 60 years and had undergone considerable changes with the erection of three major tin smelters in the immediate vicinity, plus Treloweth and Angarrack at no great distance. (see OTD 18 August 1663) Kalmeter visited Chyandour and Ludgvan but did not go to Trereife. More tin, Kalmeter says, is coined at Penzance than anywhere apart from Truro. Given that the coinage towns were Lostwithiel, Liskeard, Truro, Helston and Penzance this is not especially surprising. By 1724 the industry had moved west and become much more dependent upon lode mining rather than the streaming which had fed the medieval industry in the east. The figure Kalmeter gives for coined tin for Michaelmas quarter is 1,120 ingots, each of which weighs about 300 lbs, so about 150 tons of tin metal. This doesn't sound like a lot of product but if we try to work back toward the amount of ore mined the numbers soon stack up. The white tin metal produced by the smelter is the product of the smelting of black tin delivered by the miners. Black tin is produced at the mine by the 'tin dressers' who see to the crushing and separation of the ore, crushing and repeatedly washing it until they have separated the waste from the tin. To put this in perspective, for most of the life of Geevor Tin Mine the ore consisted of no more than 1% tin. It's likely that in Kalmeter's time the ore grade was higher but the processing losses would also have been higher so let's stick with 1%. Geevor black tin was about 70% tin so the production of 150 tons of tin metal would require a feedstock of about 215 tons of black tin. That 215 tons represented 1% of the total of mined ore so it would require the mining of 21,500 tons of ore. Allowing for poor recovery rates in processing the annual quantity of ore being mined and dressed in 1724 must have been in the region of 90,000 tons. And this does not include the mining of barren rock which also had to take place in order to access the ore. In 1724 most of this mining would have been done using picks and wedges and human muscle and ore being raised to grass using horse whims. Blasting existed in west Cornwall but added to cost of mining and was still comparatively novel and probably unreliable. The first record of blasting is in 1689 at Wheal Vor following a first use (as far as we know to date) in 1617 in the Le Thillot copper mines in Lorraine, France. For a discussion of the dating of the fire-engine at Wheal Vor see R.J. Stewart, Mine Pumping Engines in Eighteenth Century Cornwall, Trevithick Society,2017. As an example of a clearly written, well researched, nicely illustrated and properly sourced history book this is hard to beat. There was a lively discussion on aditnow a few years ago regarding the introduction of blasting in Cornish mines, see: https://www.aditnow.co.uk/community/viewtopic.aspx?t=3225. Le Thillot in 1617, which was provided in a personal communication from Geoff Tresedder, remains the best claim.